Do you ever notice that the squirrels in your garden enjoy taking food from your feeders? Not only does this deplete your feed resources for you, but it depletes them for your birds! Fortunately, this hanging bird feeder was made specifically to keep the squirrels away. 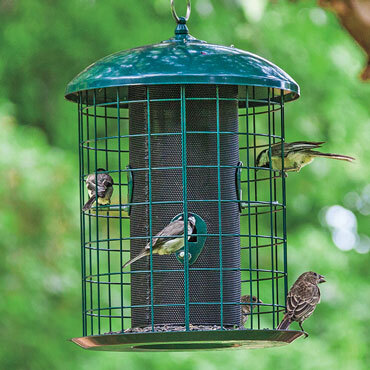 It's surrounded by a sturdy, 1.5" grid of carbon steel, protecting the metal mesh tube, which allows good air circulation to keep food fresh for the birds. Both the food and birds get extra protection from the wide, arching roof, while the bottom tray catches any fallen seed from the four feeding ports. The tray also includes drainage holes to keep food dry. 12" high x 10.75" diameter.